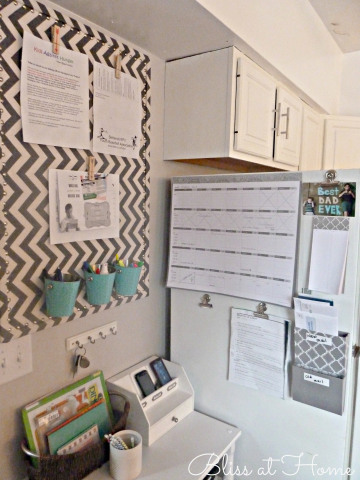 First of all, is there any term more mom blogger-y than "Household Command Center"? I apologize. I've seen a bunch of colorful & functional designs for a family's organizational hub and need to implement something similar for our house. Even with our work calendars synced up online, weekends and evening are booking up so quickly for us that we need a paper calendar hanging somewhere prominent so we can keep track. I could also use a place to consolidate bills & paperwork that need attending to. It would be helpful to also have a spot for things like the key for our tractor (oh, I haven't told you about our tractor yet?) or a shopping list for the week. While I think chalk paint is a little too trendy to have on a full wall, I do like how you can add notes right along the command center. 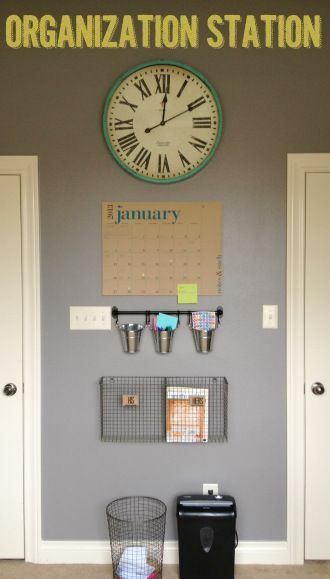 Vintage Violet Style has a simple wall with a phone charger, calendar, key hooks, & some organizational functions. The Caldwell Project's Command Center (above) utilizes some printables found online & part of Pottery Barn's Daily System. I love the idea of keeping a shredder right underneath your command center as Leah @ Fabulously Organized Home has done above. We always have a ton of stuff I need to shred that ends up in piles for weeks. I'm also into the wire baskets. Speaking of trendy, this chevron command center seems to have most of the organizational elements I need - a spot for mail, a calendar, a place to charge phones, & a spot for keys. I also like how they utilized the side of the fridge (something we'll probably have to do because of the limited space in our kitchen). 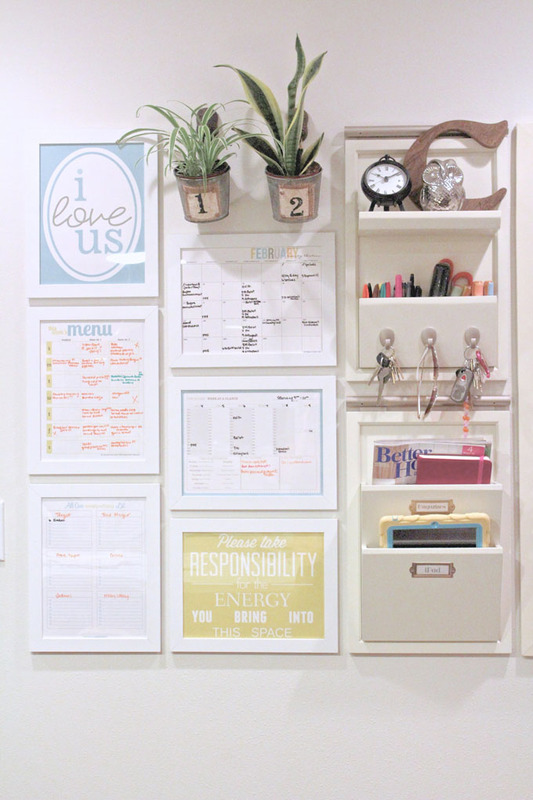 Stay organized and stay homey!